Every once in a while I pull out the stack of WLAF cards and go through them to find players to see if I can register a hit through Google. Joey Banes was one of these lucky finds. I later emailed him where he agreed to sign this card for me. A few days later I got the card back signed, plus a really nice letter, thanking me for updating him with many of the players and reaching out as a fan of the league. 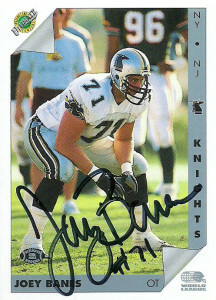 Joey Banes was an 11th round choice of the Houston Oilers in 1990 out of the University of Houston. I would assume that because Jack Pardee was Joey’s college coach there at UH and they ran the Run ‘N Shoot, it was his call to draft Joey. 1990 was a banner year for the University of Houston as Lamar Lathon, Alton Montgomery, Andre Ware, Alfred Oglesby, Craig Veasey, Chris Ellison, and Joey all heard their name on draft day. The thought was Banes could be slipped in as a project player on the practice squad for the team. The injury ridden Colts though signed Joey in November and he was elevated to the regular roster where he played in 3 games for the Colts. After the season, he’d resign as a free agent with the Houston Oilers in 1991. The Oilers were very deep on the offensive line, and despite Joey getting a little seasoning, he could not crack the roster. Joey was drafted in the 1st round of the 1992 WLAF draft. He’d be immediately reunited with fellow Oilers 3rd string quarterback Reggie Slack on the New York/ New Jersey Knights. He’d be a perfect fit for the Run N Shoot Knights, as he’d block up front for a ground game that boasted not only Slack, but Eric Wilkerson, and Chris Clairmore. The team saw dividends as the Knights’ sacks allowed were cut almost in half from the previous season (68 to 35), and the total team yards increased from 3728 to 4133. After the season, the league folded, and Banes hung up his cleats. He currently lives in Houston and works for a communications company where he raises 3 sons, who are all young, aspiring football players as well.